– we request Councillors and Council to advise how they can remedy the situation. Recently Council installed a new speed hump in Centennial Avenue between the two existing humps that are also pedestrian crossings. The existing humps are 25kph. The new hump is a 15kph which is quite steep. 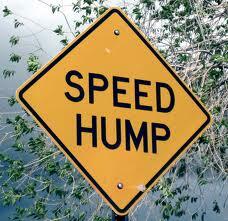 There has been a number of complaints regarding the new hump. We have asked Council to justify their actions in regard to this matter. Clr. Saville has advised that Council has engaged a consultant to review the traffic impacts of the Mowbray Road / Beaconsfield traffic signals and also to review the traffic study prepared for Lane Cove Council dealing with traffic impacts of the rezoning activity on the Lane Cove side of Mowbray Road. The consultants review will be completed in mid to late March 2014 after which it is proposed to report to Council on recommended measures. Following that it is likely that we would be consulting widely with the community in regard to a package of works on Mowbray Road and adjoining side streets. ‘Relic’ is the centrepiece of a new, elevated public park created by Mirvac as part of its 44-storey, $750 million Era residential development in the heart of the Chatswood CBD. The sculpture was put in place by crane last November and shrouded in canvas until this week. After the fire, Relic was finished in the sculpture workshop at the Australian National University School of Art. 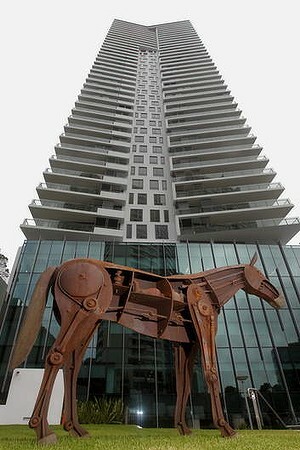 It is made from corten steel with bronze elements and salvaged industry objects within its abdomen. At long last the empty hole between The Concourse and Chatswood Chase is being developed. This is the old carpark site next to the old library. The development known as Civic Place will provide service apartments that can be used by visitors to Chatswood including patron of The Concourse. Most importantly, the development should contain’breakout’ style conference that can be hired in conjunction with functions at the Civic Pavillion.